Homemade cheesecake made with caramel topping, and toffee chips. 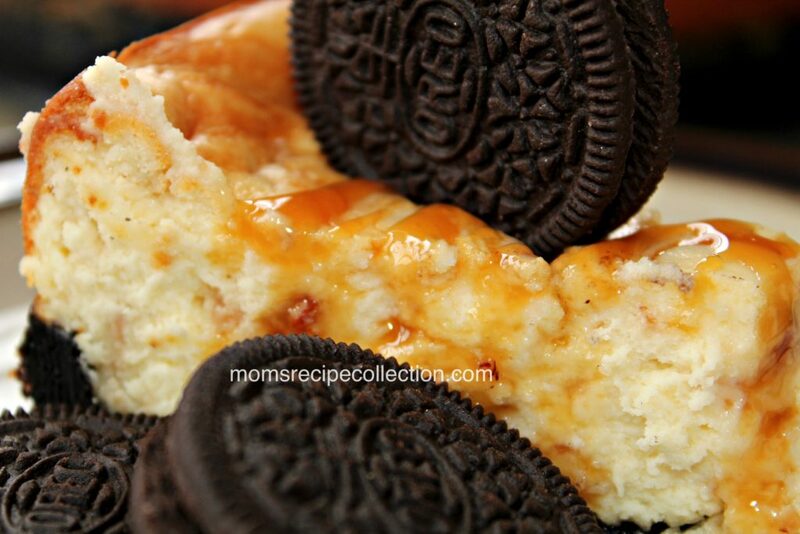 This cheesecake is also made with an Oreo cookie crust! Calling all cheesecake lovers! Boy do we have any amazing recipe for you to try. We’re going to show you how to make an amazing caramel cheesecake. This isn’t just any caramel cheesecake recipe either. It’s a completely homemade Toffee Caramel Cheesecake with Oreo Crust! This cheesecake recipe tastes similar to the Cheesecake Factory Caramel Cheesecake recipe, but it’s better- and a lot more affordable! This toffee caramel cheesecake recipe is quite simple. All you need is a few basic ingredients that can be found at your local grocery store, and you’re good to go! 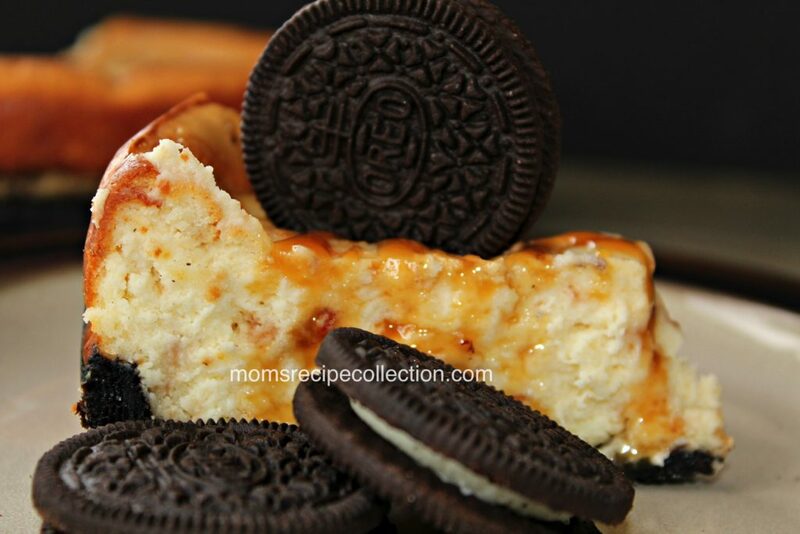 Save and share this toffee caramel cheesecake recipe on Pinterest! Print the recipe below, and subscribe to our mailing list for more free recipes! 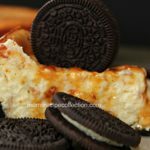 This toffee caramel cheesecake with an Oreo crust is creamy and unlike anything you've ever tasted! Place Oreos in a food processor or blender, and grade until fine. Next, make your crust by combining your Oreos, melted butter, and 1 tablespoon of sugar. Make sure your crumbs are coated but do not make into a paste. Press mixture firmly into the bottom of a cheesecake pan. Bake your crust for five minutes, and then set aside while you make your filling. In a large mixing bowl combine your cream cheese, vanilla, and one cup of sugar. Using a handmixer, mix until smooth. Pour in the toffee chips into batter and blend. Pour batter on top of your crust. Spoon caramel on to the top of your batter, and cut through your batter with a knife several times to give the marbleized effect. Bake at 350 F for 30 to 40 minutes. Center will be set and not liquidy, but not raised and baked like the outer portion. Let cool completely. Remove from cheesecake pan, and refrigerate for three hours or overnight.